With the end of 2014 approaching, NAHB’s Eye on Housing is reviewing the posts that attracted the most readers over the last year. In October, we used Census data to track property taxes among states. According to the recently released 2013 American Community Survey (ACS) New Jersey once again led the nation with the highest median real estate tax bill at $7,331. 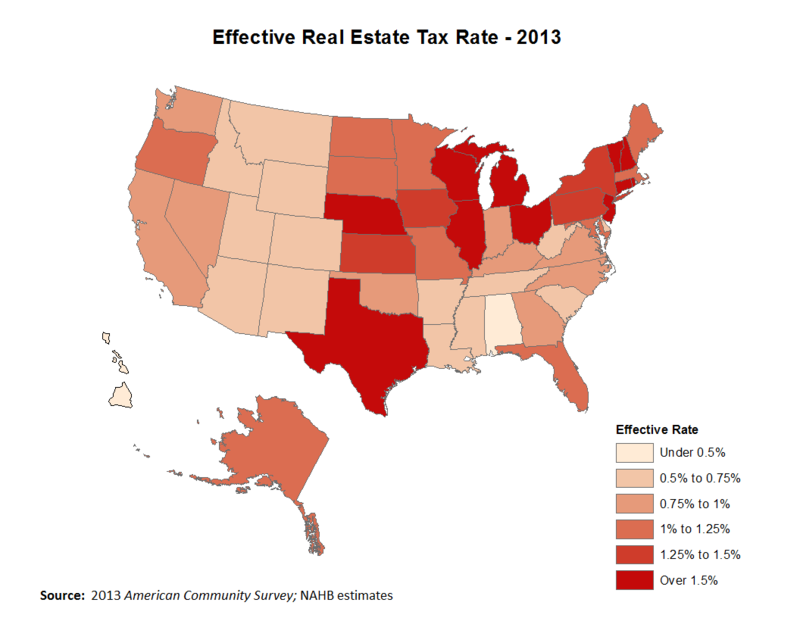 The median real estate tax bill in Alabama was $532; the lowest in the nation. There was little movement from the 2012 ACS as the composition of the top and bottom ten remained the same. The highest property tax states are found in the Northeast while the low property tax states are found in the South. 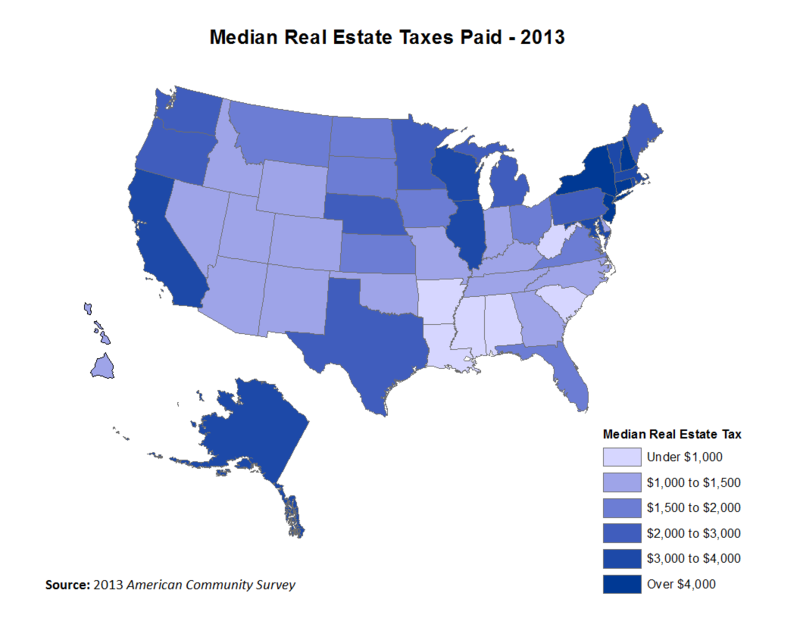 In addition to median real estate taxes paid, it is also useful to compare real estate tax rates. NAHB calculates a statewide effective real estate tax by dividing aggregate real estate taxes paid by the aggregate value of owner-occupied housing units within a state. This is a different approach from the 2012 analysis. The state with the highest NAHB calculated effective rate was New Jersey at 2.09%. The state with the lowest effective rate was Hawaii at 0.29%. Although real estate taxes are positively correlated with home values, the correlation is weak, 0.48. Therefore, cross-country differences in home values do not explain well differences in real estate tax bills. For example, according to the 2013 ACS, Michigan has the fifth lowest median housing value of owner occupied units but tenth highest effective rate of 1.54%. When comparing residential tax bills across states it is important to consider government finances. Property taxes may represent 40.3% of state and local tax receipts but some states rely less heavily on property taxes as a source of revenue than others. For example, in New Hampshire the median real estate tax bill is relatively high (3rd highest in the nation) but residents do not pay an individual income tax at the state level. West Virginia, on the other hand, has median real estate tax bill of only $605, but the top marginal rate for the individual state income tax is 6.5%. A correlation analysis confirms that the correlation between median real estate tax bill and statewide property taxes as a share of S&L government revenue is stronger, 0.66. For a complete list of median real estate taxes paid and effective real estate taxes by state click the text below.